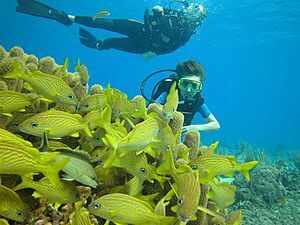 Scuba Diving is a sport where people (called "scuba divers", or simply "divers") can swim underwater for a long time, using a tank filled with compressed air. The tank is a large metal cylinder made of steel or aluminum. In the 1600s, a diving bell would be lowered that had trapped air in it. A diver would breathe that air and swim in an and out of the bell until the air became bad. Then a heavy suit was made that had a hose attached to an air compressor on land. It was difficult to swim and not get tangled, but it was safer than the diving bell. The first scuba systems used a heavy diving helmet with windows. Divers would walk on the seafloor instead of swimming. The regulator would send air to the helmet by hand control. Jacques Cousteau was a very famous Frenchman who developed several important parts of the scuba system and made it useful. One part was a better regulator that only sent air when the diver breathed in. This let the divers go farther on one tank. It was light enough to use with fins and easily swim. He also took many underwater movies and showed people what was under the water and why it needed to be protected. Tank, (one or more) containing air. The air is compressed air from the surface for most dives, but deep dives use special air with more oxygen and less nitrogen to avoid decompression sickness, also called the bends (a painful or deadly problem from going to the surface too fast). BCD (buoyancy control device) to control whether the diver floats or sinks. The diver can add air or remove air by using dump valves or an inflator on their regulator. Divers may also wear weights so they are neutral (float in place) at a depth they want. Then the BCD will move them up or down from that depth. Regulator for breathing the air from the tank. This reduces the pressure of the air coming from the tank. It adjusts the air to the pressure of the water around the diver so they can breathe easily at any depth. Depth gauge, to know how deep they are. There is also an air gauge to know how much air is left, and there may be other gauges or calculators as well. A safe dive depends on how long and how deep the diver goes, and how long it has been since the last dive. Divers also use snorkeling equipment. They wear a mask to see through, a snorkel for breathing near the surface, fins on their feet to swim better, and a wetsuit to keep them warm under water because water makes you cold four times as fast as air. Running out of air or getting the bends can be dangerous. So a person must take a certification class before going scuba diving. This proves that they have been trained on how to use the equipment and dive safely. The biggest organization for certifying divers is PADI - Professional Association of Diving Instructors - but there are many others, depending on the country. Some tourist places have a short course on certification and then lead the class in a shallow dive, all in one day. Because of special dangers, there are advanced classes for things like diving in or around underwater ship wrecks, cave diving, and deep diving (more than 60 feet or 18 meters). free diving - Diving without scuba equipment (holding your breath). Snorkeling equipment is often used in free diving. No certification is needed. Recreational diver putting on his scuba set before diving. Diver under the Salt Pier in Bonaire. Two divers giving the sign that they are "OK" on a wreck in the Dominican Republic. Scuba diving Facts for Kids. Kiddle Encyclopedia.